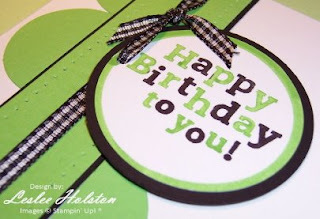 This birthday card is for my best friend in the whole world...my husband Don! I know I'm safe showing this to you days before his birthday because Don has no idea how to turn the computer on...much less how to find my blog! Today's SCS CAS15 (Clean & Simple) challenge was more of a color challenge - Black & White & one Bold Bright. A perfect challenge for Don's card. He's not into all the layers and could really care less whether I use watercolors or Crayola crayons. He will like the simplicity of the card. I love the way the bold, bright green (Green Galore) stands so striking against the black and white. Of course, this was just another excuse to use the black/white gingham ribbon that I love so much. Like I need an excuse! I used my Circle Scissor Plus again. 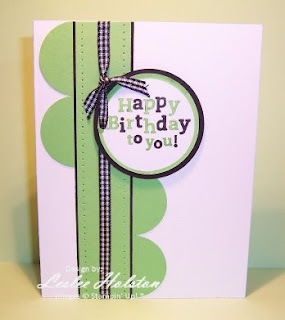 This time, I drew a circle with my Green Galore marker around the sentiment, adjusted the Circle Scissors just a tic larger and cut the circle out. This added a visual layer without the bulk of an actual layer. Once again, I adjusted the circle larger and cut out the black circle and layered the two together. I added the large scallops by punching only half of the 1-3/8" circle punch along the straight edge of the card stock and butted them up against the layered strip. I paper pierced along both sides of the layered strip for some visual interest. 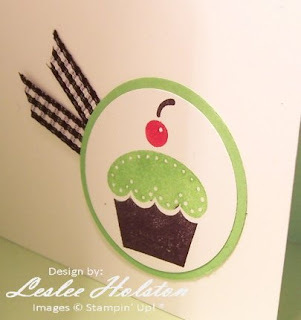 This is a look at the cupcake I placed on the inside of the card (simply because I like it). This is so bright and cheery and the layout is very clever.